I forgot to tell you all yesterday, thank you so much for all the kind comments on our fall porch and table! 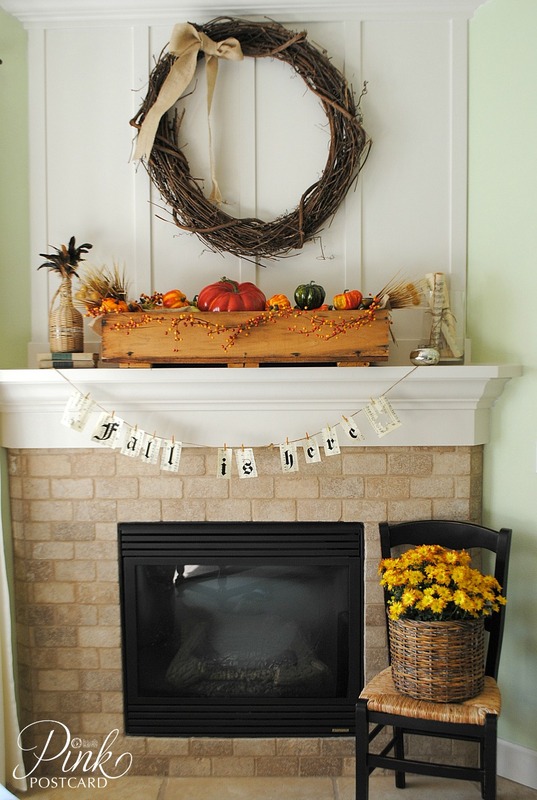 Today I am showing the mantel I put together for fall. I saw a great deal on these wood planter boxes, so I picked up two- one for decorating with, and the other to finally put on our house! I know I can use it for lots of other projects, so it was a bargain! 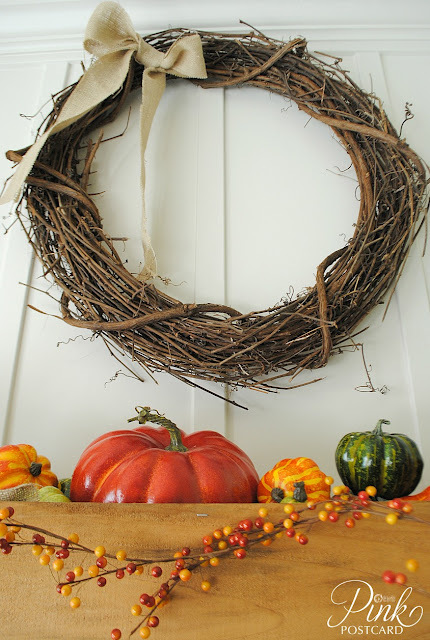 I added in the grapevine wreath from last year, and then worked on filling up the planter box with pumpkins and gourds. A little spray of pepperberries. The fall grass was an amazing deal from the Dollar Tree. But this was one of the best deals for something I will use a lot! I cleaned out what they had at one of their locations here in town. 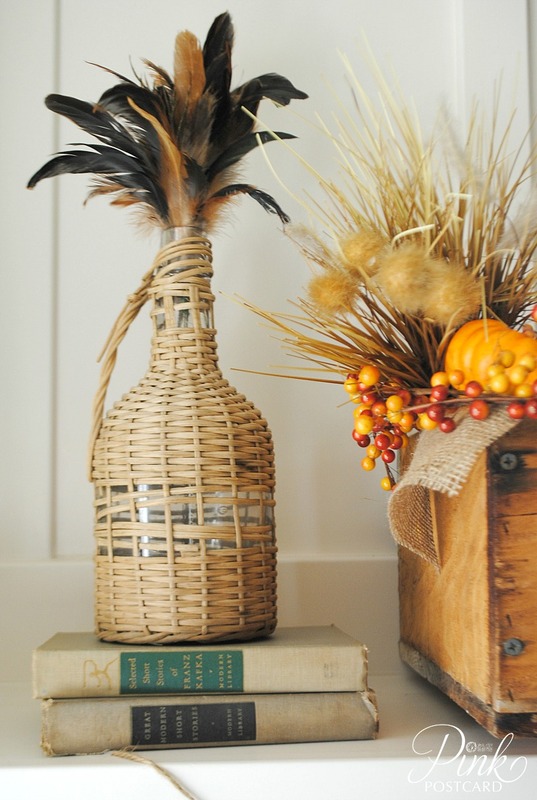 A demijohn with some feather plumes. On the other side of the trough, I used a large clear vase to hold some rolled sheet music, just for a little graphic punch. A small mercury glass votive for some sparkle to all the rough hewn. The fall banner that I made last year, is here again. A gothic font printed on sheet music; the ends both have a leaf cut out of the middle. All hung with mini clothespins. I also had a little fun using one of our nook chairs to hold the basket of mums. The black really tied into the fall look. A bit different from our dining room look. Like the dining room, it's been fun to look back and see how my style has changed over the last couple years. You can see last year's here. I'm linking up once again to the Fall Party! It all looks so beautiful, Denise. I'm keeping my eyes peeled for one of those rustic tool caddies, but I'm thinking I may have to ask The Man to build one for me. 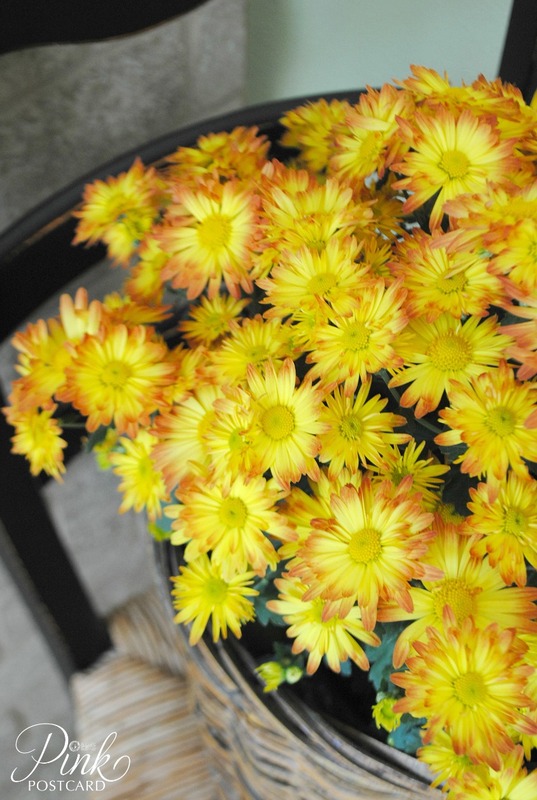 Took a peek at your front door display, too. Vey lovely! Still a bit too hot for real pumpkins here, but it's starting to cool down. With all the references to Salem & the Willamette Valley, I'm guessing you live up their in our old stomping grounds. The Man was born and grew up in Salem, we met at OSU (I lived in Corvallis), & we made our home for ten years in Tualatin before moving to Arizona almost 30 years ago. 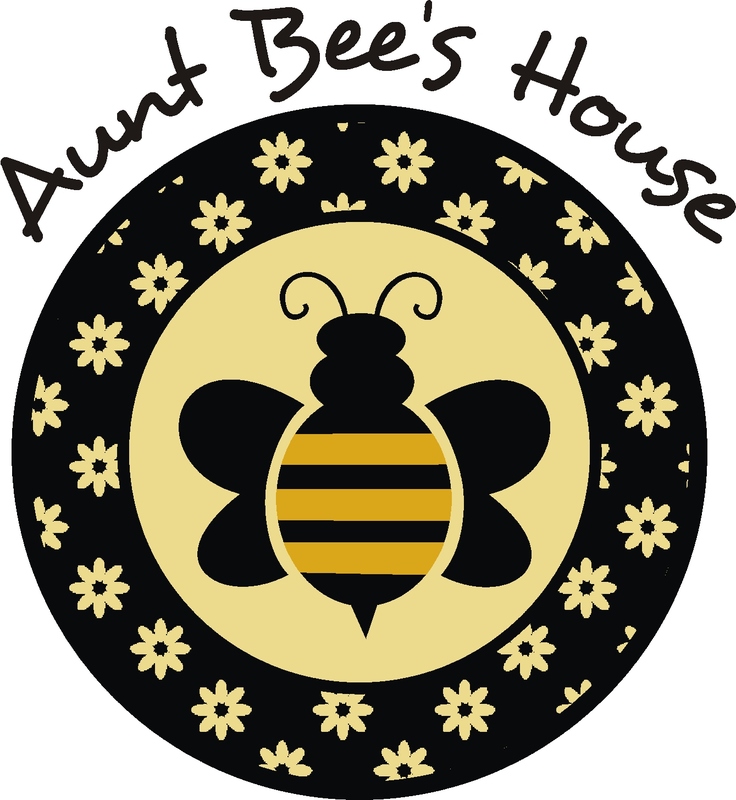 LOVE the wreath and the banner!!!!! It looks great! 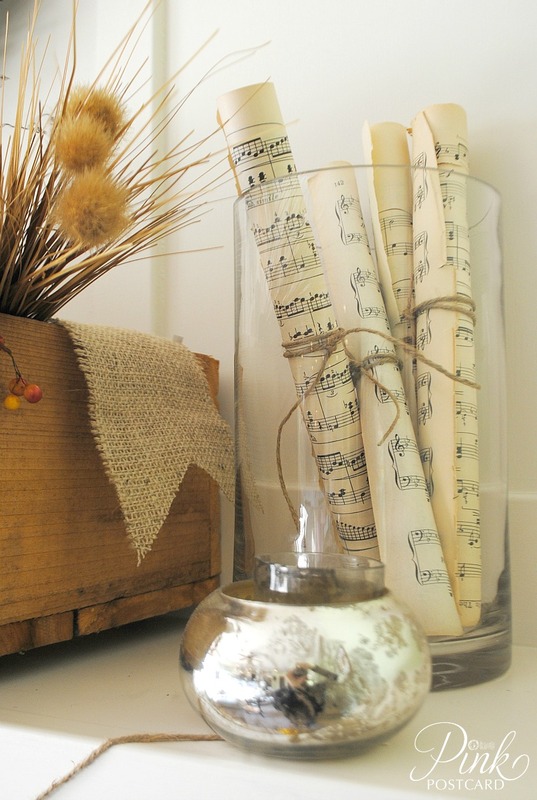 I love the rolled sheet music--so simple and looks so good. Denise, I absolutely love the rustic look creation! It's my idea of fall! 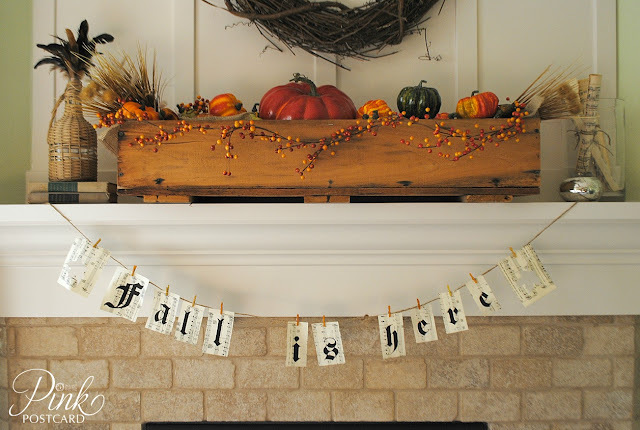 What a cute mantel! Great job and happy fall! Love the mantel the pepperberries ae one of my favorites. The mum looks so cute on the chair. It's lovely Denise! Fall is such a fun season! So pretty! 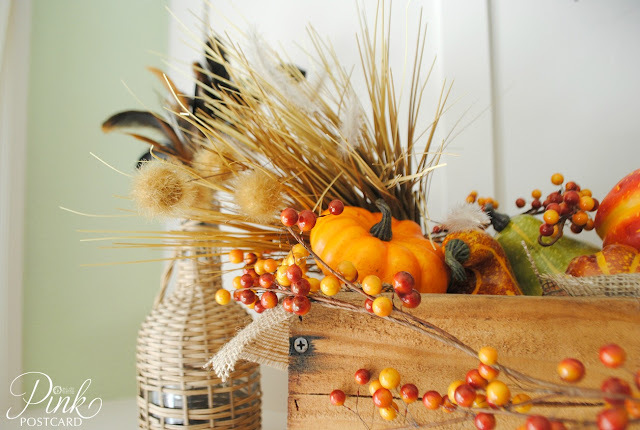 I love the box you found...it will be great for so many displays year round!